As a Certified Kinesis Dealer shipping is only permitted to USA addresses. Most keyboards including ergonomic models have a 10-degree positive slope from front to back. These designs tend to bend your wrists. The Freestyle2 has a zero-degree slope which minimizes the height, effectively creating negative slope and reducing wrist extension. The slim design provides you a 2-in-1 office and travel keyboard. From small to tall and body types in between, the Freestyle2 allows for maximum flexibility catering to each individuals unique needs. Out of the box both modules are connected together by a flexible pivot tether allowing an infinite range of splay. Disconnecting the pivot tether allows up to 9 inches of complete separation of both left and right keying modules. Perfect for individual needs ranging from a narrow footprint to complete separation. This design greatly reduces and or/eliminates ulnar deviation. The 2-port 2.0 USB hub enables you to easily connect other input devices such as mice without having to access USB ports on your computer. This KB830HMB-US model included padded palm supports reduce wrist extension by keeping wrists neutral. Your comfort . . . 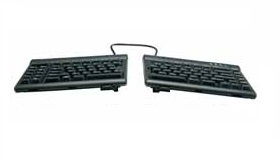 The only keyboard that adjusts to each individual’s unique body type from petite to large frame. Infinitely variable splay using pivot tether. Offers up to 9 inches of complete separation. Your style . . .
Sleek, low profile design offers zero degree slope from front to back, reducing wrist extension. Narrow footprint allows close placement of any pointing device reducing over-reach. Dramatically thinner design, suitable for both office and travel. Optional, interchangeable accessories satisfy diverse user needs and allow organizations to standardize on a single-source solution. Simple, sturdy adjustment mechanisms. Intuitive to configure and use. Three optional accessories provide adjustable lateral tilt to reduce forearm pronation. Choose features with or without integrated palm supports, tent settings of 5, 10 and 15 degrees or more progressive settings between 20 and 90 degrees. V-lifter and Integrated Palm Supports. Attach easily to Freestyle2 Keyboard. Allows quick, reproducible slope settings of 5, 10 and 15 degrees. Ideal replacement for other complicated, unstable or hard-to-tent keyboards. Integrated, padded palm supports keep wrists neutral at rest. Use with or without pivot tether for greater separation. For individuals that require tenting, variable splay and/or separation with integrated palm supports. 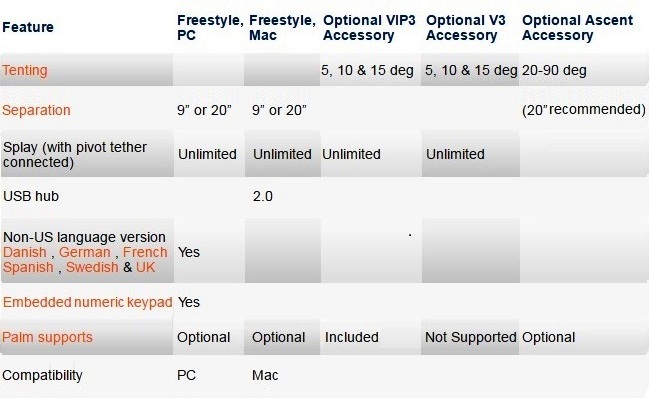 Freestyle2 keyboard VIP3™ Accessory sold separately. Unlike the VIP3, the V3 does not use palm supports. 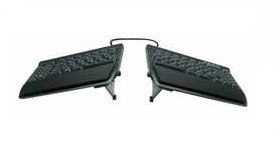 The V3 V-lifters quickly and easily alternate the slope of the keyboard from 5, 10 and 15 degrees. For individuals that require tenting, variable splay and/or separation without integrated palm supports. Freestyle2 keyboard V3™ Accessory Already pre-installed to this KB830HMB-US. Two multi-angle tenting modules attach to underside of keying modules. Includes a linking plate which may be used to connect keying modules. Sturdy steel construction. Tenting angles may be independently set for each keying module 20 to 90 degrees, in 10 degree increments. Can be used in conjunction with the optional Freestyle2 palm supports, 20, 30 and 40 degree ranges. 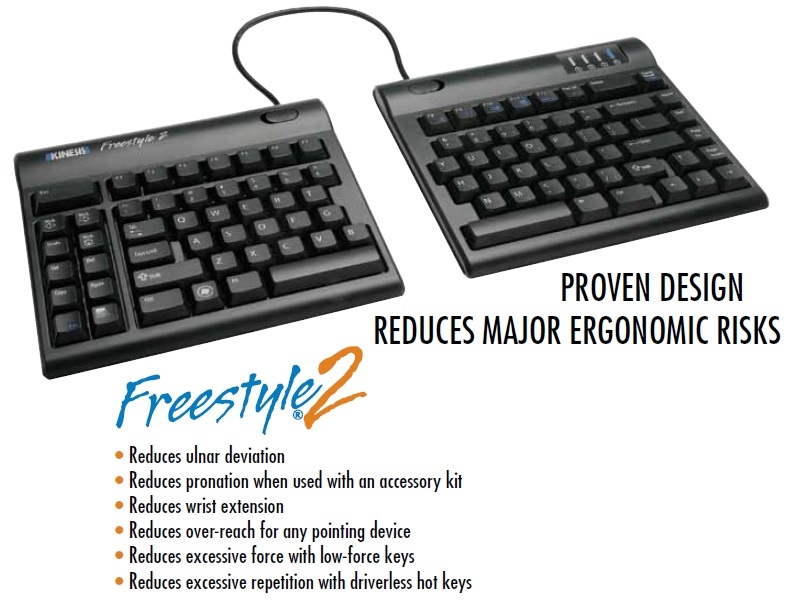 Freestyle2 keyboard Ascent™ Accessory sold separately. 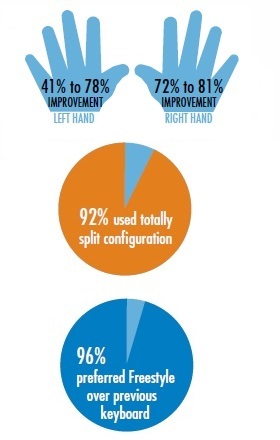 Participants showed dramatic improvement in reducing ulnar deviation for all body types. No loss of performance was measured by subjects with Freestyle using quantitative data logging. Subjects reported higher productivity using the Freestyle (99% confidence level). 48% of subjects used some level of keyboard tenting with the snap-on, two-angle tenting (VIP) accessory. 2-port USB 2.0 hub compatible with low-powered peripherals only e.g. flash drives mice. High powered devices such as iPhones and iPads are not compatible. Compatible with PC as a basic keyboard. Hot keys are not compatible. * Hot Keys for Linux, remote access, and terminal emulation: Hot keys on the PC Freestyle are designed for Windows and may not be supported by Linux Sun systems or by some browsers. Some hot keys will not work if you are using terminal emulation or remote access. The standard Advantage contoured keyboard utilizes the Cherry MX low-force tactile switch (brown stem). 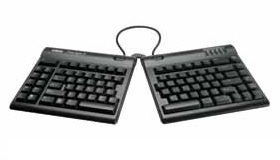 It is a semi-custom low force tactile design created in 1992 to Kinesis’ specifications. “Tactility” is a slightly elevated force around the midpoint of the stroke of the key which lets you know the switch is about to be activated. A tactile response is preferred by many ergonomists, because it cues your fingers that activation is about to occur and is thought to reduce the likelihood or incidence or “bottoming out” the switch with a hard impact. The peak (tactile) force is ~55gm, following by an activation force of ~45 gm. 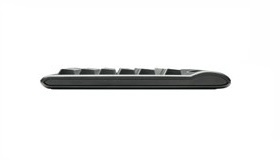 The Advantage LF (Linear Feel) contoured keyboard utilizes the Cherry MX Red linear switch. It is virtually identical to the brown-stem switch except for the absence of a “tactile peak.” There is a consistent force throughout the full stroke of the key so there is no tactile feedback unless the switch bottoms out. Many gamers and heavy typists prefer the Cherry Red’s due to their “smoother” feel. 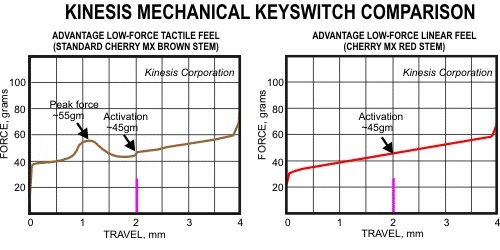 Since there is no “peak” or tactile force, the total effort required to reach the activation force of 45 gm is slightly less than with the tactile (brown stem) switch. In tens of thousands of keystrokes per hour, those small differences can add up. Is the Freestyle only for people with wide shoulders? No. The Freestyle is designed to accommodate a wide range of body types from petite to large framed individuals. 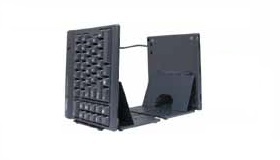 When both modules are attached the foot print of the keyboard is only 15 3/8 inches wide but allows for unlimited splaying catering to smaller body types. For larger individuals the two keying modules can be unattached allowing up to 9 inches of complete separation. For users requiring more than 9 inches we offer a version with up to 20 inches of separation. The idea behind the Freestyle was to create a flexible, yet easy to configure modular family of products. The Freestyle keyboard offers everything you need except tenting. For tenting needs we offer three simple accessories that can be used with keyboard modules attached or separated for full flexibility. Freestyle2 VIP3 – provides adjustable slope (5, 10 and 15 degrees). Includes clip-on padded palm supports that must be attached in order to use V-lifters. Can be used with keyboard modules attached or separated. Compatible only with the Freestyle2. Freestyle V3 – offers adjustable slope setting of 5, 10 and 15 degrees without the use of integrated palm supports (note: use the VIP3 accessory if palm supports are desired with tenting). Compatible with original Freestyle and Freestyle2. Freestyle Ascent – offers more progressive slope settings between 20 and 90 degrees (in ten degree increments). Compatible with Freestyle and Freestyle2. 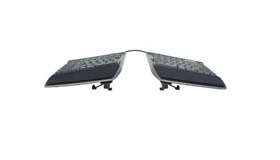 Each accessory enhances the core feature set of the Freestyle keyboard and attaches easily to its underside. As an additional accessory, Palm Supports can be purchased and used when typing with the keyboard flat to promote neutral wrist posture. Replaceable palm pads included. The 10-key is embedded into the right key well of the keyboard (just like you would find on a laptop). This reduces the overall length of the keyboard allowing for closer placement of any pointing device, thereby, reducing over-reach issues. A separate numeric keypad for PC is available for intensive number crunchers. What was the idea behind the driverless hot keys? The main objective behind creating these unique left-hand hot keys was to reduce mouse clicking and awkward key combinations for commonly used actions. Since its plug n’ play NO special drivers are required to utilize the hot keys. This makes IT departments very happy! Hot Keys for the PC: Cut, Copy, Paste, Home, Undo and Internet Page Forward & Page Back. What is the key force? We devoted extensive effort to developing a low-force yet tactile key switch. Most traditional keyboards, including Microsoft’s latest ergonomic keyboard, utilize key switches with an activation force of approximately 60 grams. Because keyboarding is an intensely repetitive task, any reduction in key force can improve comfort and reduce the likelihood of injury. We were able to design a key switch for the Freestyle with a typical average key force of 45 grams, approximately 25% less than most other keyboards. The key switch is also very quiet and tactile. Why aren’t there pop-up feet to raise the back of the keyboard? Optional clip-on, palm supports are available to promote neutral wrist posture. No pop-up feet that raise the back of the keyboard. 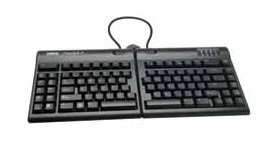 We also recommend utilizing an adjustable keyboard platform such as the Kinesis Solution Platform System which properly positions the keyboard and other input devices at the correct height as well as offering adjustable negative tilt of the keyboard tray. Was the Freestyle2 designed with any particular pointing device in mind? We did not design the Freestyle2 with any specific pointing device in mind, though we did eliminate the number keypad in order to reduce over-reach issues for any mouse with right handed use. Some users find it convenient to place a touchpad or trackball between the two split keying modules, but most users prefer a conventional mouse used in the normal (but closer, more comfortable) location. 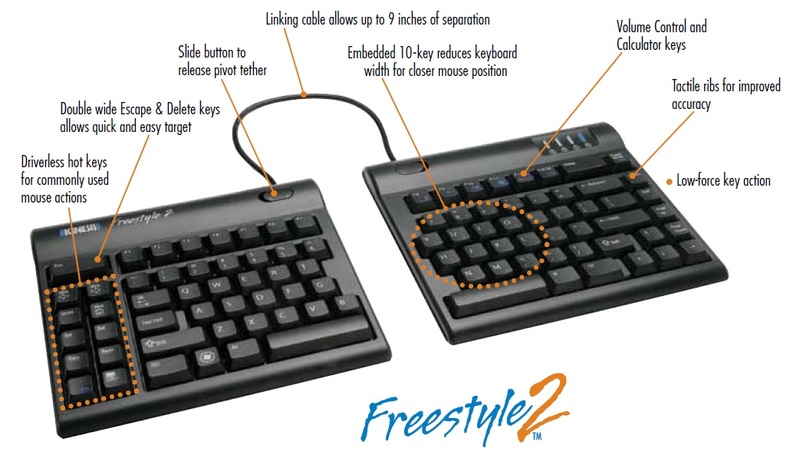 Click on the following links to view the Freestyle2 with different peripheral configurations. All Kinesis manufactured products come with a two-year limited warranty to the original purchaser. What support do you offer during setup as well as follow-up? Each Freestyle product includes detailed printed instructions as well as installation instructions labeled on each accessory. The user guides also can be found on the manual page of download tab.